About MIDI channels, voices, timbres and Modes. subscribe to the Phil Rees Music Tech email newsletter. 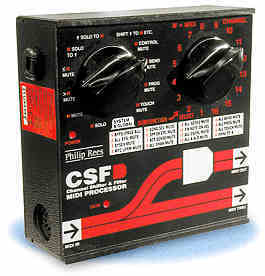 The CSF MIDI Channel Shifter and Filter is an uncomplicated compact hardware-based MIDI processor unit with a built-in mains power supply. This versatile gadget allows you to selectively pass or reject MIDI messages by channel, or to alter their channel assignments. It also makes it possible to mute a specific message type on a specific channel, or on all channels. MIDI System messages can also be selectively muted. The MIDI messages that relate to performance events are tagged with channel numbers. This means that one MIDI datastream can carry up to sixteen independent lines of musical performance (parts). MIDI channels can be selected on receiving devices in a manner comparable to tuning a radio or television set to the desired channel. Some messages are not assigned to MIDI channels, and these are called System messages. N SOLO MIDI CHANNEL Only messages on the selected channel are passed. N MUTE MIDI CHANNEL Only messages on the selected channel are rejected. >N MUTE MIDI CHANNEL All channel messages above, and NOT including, the selected MIDI channel are rejected. <N MUTE MIDI CHANNEL All channels messages below, AND including, the selected MIDI channel are rejected. N SOLO TO 1 MIDI CHANNEL All messages on the selected channel are put out on channel 1. All other channel messages are rejected. 1 SOLO TO N MIDI CHANNEL All messages on channel 1 are put out on the selected channel.. All other channel messages are rejected. SHIFT 1 TO N ETC. MIDI CHANNEL Channel tags of all channel messages are bumped 'round-the-clock' by the selected offset. N CONTROL MUTE MIDI CHANNEL All Control Change messages on the selected MIDI channel are rejected. N BEND MUTE MIDI CHANNEL All Pitch Bend messages on the selected MIDI channel are rejected. N PROG MUTE MIDI CHANNEL All Program Change messages on the selected MIDI channel are rejected. N TOUCH MUTE MIDI CHANNEL All polyphonic and channel After-Touch messages on the selected MIDI channel are rejected. SYS & GLOBAL 1 BYPASS All MIDI data is passed through unaltered. SYS & GLOBAL 2 ALL SYS MUTE All System messages (Exclusive, Real Time, and Common) are rejected. SYS & GLOBAL 3 SYSEX MUTE All System Exclusive messages are rejected. SYS & GLOBAL 4 MTC 1/4 FRM MUTE All MIDI Time Code quarter frame messages are rejected. The full message is, however, passed. SYS & GLOBAL 5 S SEL MUTE All Song Select messages are rejected. SYS & GLOBAL 6 SPP CK ETC. MUTE All Clock, Start, Stop, Continue and Song Position Pointer messages are rejected. SYS & GLOBAL 7 ACT SENSE MUTE Active Sensing and System Reset messages are ignored. SYS & GLOBAL 8 ALL CHAN MUTE All types of Channel Voice and Mode message on all MIDI channels are rejected. SYS & GLOBAL 9 ALL NOTES MUTE All Note On and Off and polyphonic After-Touch messages on all MIDI channels are rejected. SYS & GLOBAL 10 FIX NOTE-ON VEL All notes are put out at a fixed attack velocity of 100. SYS & GLOBAL 11 ALL CTRL MUTE All Control Change messages are rejected. SYS & GLOBAL 12 ALL A-N-O MUTE All All-Notes-Off messages are rejected. SYS & GLOBAL 13 ALL BEND MUTE All Pitch Bend messages are rejected. SYS & GLOBAL 14 ALL PROG MUTE All Program Change messages are rejected. SYS & GLOBAL 15 ALL TOUCH MUTE All poly and chan After-Touch messages are rejected. SYS & GLOBAL 16 OMNI TO 1 All messages on all channels are put out on channel 1. Under the SHIFT 1 TO N ETC channel function, all MIDI messages are retransmitted. However, before retransmission, the channel tags of all Channel messages are increased by one less than the number selected by the right-hand rotary control (if the sum is greater than sixteen, subtract sixteen from the sum). In other words, the channel tags of all Channel messages are shifted or bumped "round the clock". For example, messages received on channel one are mapped to the selected channel. Note that, if the right-hand control is set to channel one, the channel tags will not be altered. The unit is a neat 109mm x 109mm x 40mm. MIDI In, Out and Thru ports are provided and the integral mains lead (ac power cord) comes with a plug. An LED power indicator is provided. There is also a lamp which flashes to indicate MIDI received DATA. As with all our mains (ac) powered products versions are available for 110 V ac as well as 230 V ac. Plugs for various international standards are also available. The CSF information on this page is also available as an Acrobat .pdf file - size: 312K bytes.